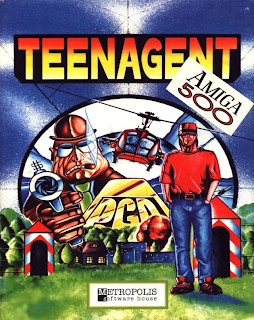 Teen Agent (or Teenagent) is an adventure game that follows a teenager named Mark who is hired by a secret organization to become a spy and discover how a millionaire named John Noty is acquiring his riches. Developer Metropolis Software House was purchased by CD Projekt in 2008, and in 2010, the game was released for free through CD Projekt's GOG.com. Teen Agent is now supported by ScummVM, a program designed to let 2D adventure games run on multiple platforms. With ScummVM, Teen Agent now runs on modern versions of windows, as well as Linux, Mac OS X, and many consoles such as Dreamcast, Wii, PlayStation 2, and PlayStation Portable. For a complete list of platforms supported by ScummVM, see here.